Hormone Replacement Therapy (commonly known as HRT) has been a subject of heated debate over the last couple of decades. As women age, their estrogen levels decline. 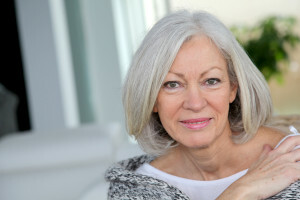 When women enter menopause, their estrogen production is very low; this usually causes symptoms like hot flashes, night sweats, vaginal dryness, mood changes, and irritability. Symptoms can range from mild to severe and can last years. Hormone Replacement Therapy is a way to combat these symptoms, but not everybody is on board with this treatment. Let’s take a minute to learn a little bit about this history of Hormone Replacement Therapy. Premarin, introduced in 1942, was the first type of Hormone Replacement Therapy on the market. It gained popularity in the 60s and it was used for many years. The estrogen was taken from the urine of pregnant mares. After Premarin came Prempro, a pill that had both estrogen and progesterone. Millions of women were prescribed these pills to combat the symptoms of menopause. In the 1990s there was growing concern over these hormone pills, where the estrogen came from, and if the medicine was safe to take. Many women stopped taking their estrogen and found that their menopausal symptoms immediately came back. In 2002 and 2003 some widely published studies suggested that women who took HRT were more at risk for breast cancer, stroke, blood clots, and heart disease. Doctors became confused, wondering if they were exchanging one set of problems for another, warning labels were put on hormones, and millions more women stopped taking Hormone Replacement Therapy afraid of ending up with breast cancer. Then, a few years later, new studies suggested that women who used HRT were actually protecting themselves from those same diseases. There was even more confusion now– some studies said Hormone Replacement Therapy was safe, yet others said they weren’t. Now, we are lucky to have bioidentical hormones on the market. These hormones, derived from plants, have the same molecular structure as the estrogen in your body– your body cannot tell the difference. Bioidentical hormones come in sprays, patches, creams, and pills, and have wonderful results. Although they still have the FDA warnings on the side, these hormones do not carry the same risks of earlier estrogens. Dr. Davis believes bioidentical hormones are safe, and he will happily discuss their safety with you.